If you find the Samsung Galaxy Note 8.0 too small a tablet, then you might want to check out the latest 2014 edition of the Note 10.1. In a nutshell, it’s an oversized Note 3. The design DNA totally inherits the Note 3: leather textured back, line textures around the sides, the hardware buttons in landscape mode, the S Pen, the 2.3GHz quad-core processor. The TouchWiz UI is based on the phone version, not the tablet. This means the dropdown notification fills up the entire screen, which is rather overwhelming. Samsung fits a high-density 2560×1600 WQXGA screen on a 10.1-inch. On paper, it sounds fantastic, as text looks smooth and photos look crisp. In reality, images actually look awful, because it basically enlarges any compression artefacts that are already inherent, just that they are not noticeable on small screens. All Android apps are not optimised to run on such high-resolution screen, so extrapolation results when say, browsing Facebook or Instagram. The only few major benefits with such high-res screen are browsing web, reading ebook, viewing high-res images. Running 2 apps side-by-side on such a large device is awesome. You get 1280×1600 worth of pixels on each screen, that’s even more pixels than 2 low-end smartphones! It doesn’t feel as cramp as the Note 3. Finally, a large tablet with a top-notch 8MP camera. For years, tablets are armed with 5MP and below, due to the notion that consumers do not use tablets for serious photo or video taking. The Note 10.1 (2014) can do the same advanced shooting features as the S4 or the Note 3, for instance, dual shot – except no UHD (4K) video recording. I am probably one of the few geeks on the planet that do not find tablets useful. To me, whatever I can do on the tablet, I could already do it on my phone. If I needed to use a large screen for whatever I needed to do, I would probably work better on a laptop, which has a full keyboard an a natural “stand” to adjust the screen angle. Holding a tablet to consume content is just too heavy and I would end up placing it on a table top, making it no different from a laptop. Typing on the on-screen keyboard gives me mental block: I find myself straining my brains to support the tablet with my hands, to hit the right keys, and to apply auto-correct, instead of letting my fingers flow naturally with the content coming out of my mind. 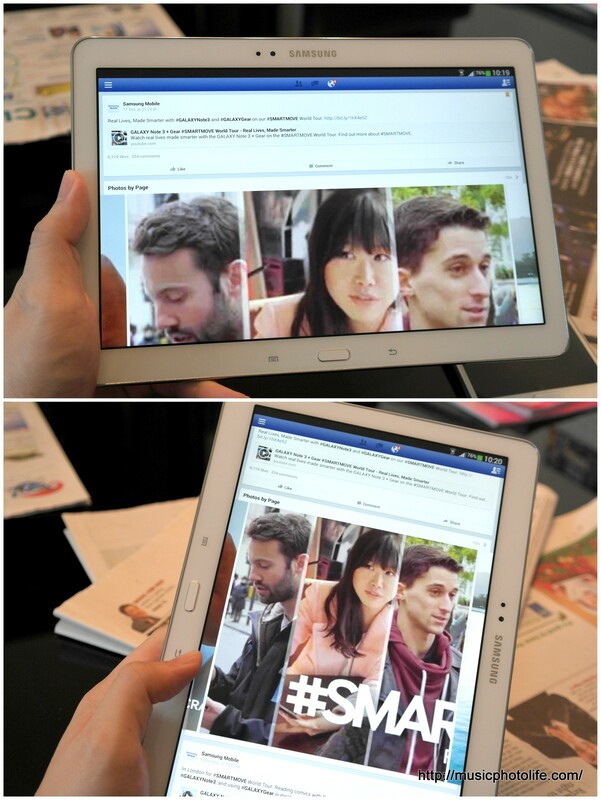 But don’t let that stop you from owning the Samsung Galaxy Note 10.1 2014 Edition. It carries the goodness of the Galaxy Note 3 in a larger ultra-highres screen, albeit the same ancient TouchWiz UI template. It is build of durable materials like Note 3, so you do not have to worry about scratches or dings. This is the top tablet with sufficient hardware specs to last you through 2014.